Afeeld is a full-length collection of playable intermedia and concrete art compositions that exist in the space between poetry and videogames. It was published as a 'Digital Original' by the Collaboratory for Digital Discourse and Culture at Virginia Tech in 2017. Content from Afeeld has been exhibited at the Library of Congress in Washington, DC, the 2013 Modern Language Association Convention in Boston, MA, the 2012 Electronic Literature Organization Conference in Morgantown, WV, the Carroll Gallery at Tulane University, the Ellen Powell Tiberno Museum in Philadelphia, PA, the CalArts Library in Valencia, CA, the 2011 Association of Writers and Writing Programs Conference in Washington, D.C., the 2010 Post_Moot Convocation at Miami University of Ohio, and the Zaoem Festival of Contemporary Poetry in Ghent, Belgium. Excerpts have also appeared online in Abjective, Certain Circuits, London Poetry Systems, Otoliths #16, Oxford Magazine, and Word For/Word #14. 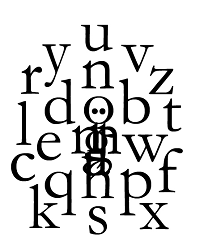 Alphabet Man was published as a chapbook by Slack Buddha Press in April 2010, and was honored with an &Now Award for Innovative Writing in 2012. Count as One was published as a chapbook in the Fall 2009 issue of New River: a Journal of Digital Writing and Art. This is Visual Poetry was published in July 2010, as the 51st chapbook in Dan Waber's "This is Visual Poetry" chapbook series. Asterisk has been supported by the National Endowment for the Humanities, through a grant made by the Humanities Gaming Institute at the University of South Carolina.